A CubeSat (U-class spacecraft) is a type of miniaturized satellite for space research that is made up of multiples of 10 cm × 10 cm × 10 cm (4 in × 4 in × 4 in) cubic units. CubeSats have a mass of no more than 1.33 kilograms (2.9 lb) per unit, and often use commercial off-the-shelf (COTS) components for their electronics and structure. CubeSats are commonly put in orbit by deployers on the International Space Station, or launched as secondary payloads on a launch vehicle. Over 1000 CubeSats have been launched as of January 2019. Over 900 have been successfully deployed in orbit and over 80 have been destroyed in launch failures. In 1999, California Polytechnic State University (Cal Poly) and Stanford University developed the CubeSat specifications to promote and develop the skills necessary for the design, manufacture, and testing of small satellites intended for low Earth orbit (LEO) that perform a number of scientific research functions and explore new space technologies. Academia accounted for the majority of CubeSat launches until 2013, when more than half of launches were for non-academic purposes, and by 2014 most newly deployed CubeSats were for commercial or amateur projects. Uses typically involve experiments that can be miniaturized or serve purposes such as Earth observation or amateur radio. CubeSats are employed to demonstrate spacecraft technologies intended for small satellites or that present questionable feasibility and are unlikely to justify the cost of a larger satellite. Scientific experiments with unproven underlying theory may also find themselves aboard CubeSats because their low cost can justify higher risks. Biological research payloads have been flown on several missions, with more planned. Several missions to the Moon and Mars are planning to use CubeSats. In May 2018, the two MarCO CubeSats became the first CubeSats to leave Earth orbit, on their way to Mars alongside the successful InSight mission. Some CubeSats became the first national satellites of their countries, being launched by universities, state, or private companies. The searchable Nanosatellite and CubeSat Database lists over 2,000 CubeSats that have been and are planned to be launched since 1998. Professors Jordi Puig-Suari of California Polytechnic State University and Bob Twiggs of Stanford University proposed the CubeSat reference design in 1999:159 with the aim of enabling graduate students to design, build, test and operate in space a spacecraft with capabilities similar to that of the first spacecraft, Sputnik. The CubeSat, as initially proposed, did not set out to become a standard; rather, it became a standard over time by a process of emergence. The first CubeSats launched in June 2003 on a Russian Eurockot, and approximately 75 CubeSats had entered orbit by 2012. The term "CubeSat" was coined to denote nanosatellites that adhere to the standards described in the CubeSat design specification. Cal Poly published the standard in an effort led by aerospace engineering professor Jordi Puig-Suari. Bob Twiggs, of the Department of Aeronautics & Astronautics at Stanford University, and currently a member of the space science faculty at Morehead State University in Kentucky, has contributed to the CubeSat community. His efforts have focused on CubeSats from educational institutions. The specification does not apply to other cube-like nanosatellites such as the NASA "MEPSI" nanosatellite, which is slightly larger than a CubeSat. GeneSat-1 was NASA's first fully automated, self-contained biological spaceflight experiment on a satellite of its size. It was also the first U.S.-launched CubeSat. This work, led by John Hines at NASA Ames Research, became the catalyst for the entire NASA CubeSat program. The CubeSat specification accomplishes several high-level goals. The main reason for miniaturizing satellites is to reduce the cost of deployment: they are often suitable for launch in multiples, using the excess capacity of larger launch vehicles. The CubeSat design specifically minimizes risk to the rest of the launch vehicle and payloads. Encapsulation of the launcher–payload interface takes away the amount of work that would previously be required for mating a piggyback satellite with its launcher. Unification among payloads and launchers enables quick exchanges of payloads and utilization of launch opportunities on short notice. Standard CubeSats are made up of 10×10×11.35 cm units designed to provide 10×10×10 cm or 1 liter of useful volume while weighing no more than 1.33 kg (2.9 lb) per unit. The smallest standard size is 1U, while 3U+ is composed of three units stacked lengthwise with an additional 6.4 cm diameter cylinder centered on the long axis and extending 3.6 cm beyond one face. The Aerospace Corporation has constructed and launched two smaller form CubeSats of 0.5U for radiation measurement and technological demonstration. Since nearly all CubeSats are 10×10 cm (regardless of length) they can all be launched and deployed using a common deployment system called a Poly-PicoSatellite Orbital Deployer (P-POD), developed and built by Cal Poly. No electronics form factors or communications protocols are specified or required by the CubeSat Design Specification, but COTS hardware has consistently utilized certain features which many treat as standards in CubeSat electronics. Most COTS and custom designed electronics fit the form of PC/104, which was not designed for CubeSats but presents a 90 × 96 mm profile that allows most of the spacecraft's volume to be occupied. Technically, the PCI-104 form is the variant of PC/104 used and the actual pinout used does not reflect the pinout specified in the PCI-104 standard. Stackthrough connectors on the boards allow for simple assembly and electrical interfacing and most manufacturers of CubeSat electronics hardware hold to the same signal arrangement, but some products do not, so care must be taken to ensure consistent signal and power arrangements to prevent damage. Care must be taken in electronics selection to ensure the devices can tolerate the radiation present. For very low Earth orbits (LEO) in which atmospheric reentry would occur in just days or weeks, radiation can largely be ignored and standard consumer grade electronics may be used. Consumer electronic devices can survive LEO radiation for that time as the chance of a single event upset (SEU) is very low. Spacecraft in a sustained low Earth orbit lasting months or years are at risk and only fly hardware designed for and tested in irradiated environments. Missions beyond low Earth orbit or which would remain in low Earth orbit for many years must use radiation-hardened devices. Further considerations are made for operation in high vacuum due to the effects of sublimation, outgassing, and metal whiskers, which may result in mission failure. Different classifications are used to categorize such miniature satellites based on mass. 1U CubeSats belong to the genre of picosatellites. In recent years larger CubeSat platforms have been developed, most commonly 6U (10×20×30 cm or 12×24×36 cm) and 12U (20x20x30 cm or 24x24x36 cm), to extend the capabilities of CubeSats beyond academic and technology validation applications and into more complex science and national defense goals. In 2014 two 6U Perseus-M CubeSats were launched for maritime surveillance, the largest yet at the time. The 2018 launch of the InSight lander to Mars included two 6U CubeSats called Mars Cube One (MarCO). Most CubeSats carry one or two scientific instruments as their primary mission payload. A skeletonized 1U structure with computer. The number of joined units classifies the size of CubeSats and according to the CubeSat Design Specification are scalable along only one axis to fit the forms of 0.5U, 1U, 1.5U, 2U, or 3U. All the standard sizes of CubeSat have been built and launched, and represent the form factors for nearly all launched CubeSats as of 2015. Materials used in the structure must feature the same coefficient of thermal expansion as the deployer to prevent jamming. Specifically, allowed materials are four aluminum alloys: 7075, 6061, 5005, and 5052. Aluminum used on the structure which contacts the P-POD must be anodized to prevent cold welding, and other materials may be used for the structure if a waiver is obtained. Beyond cold welding, further consideration is put into material selection as not all materials can be used in vacuums. Structures often feature soft dampers at each end, typically made of rubber, to lessen the effects of impacting other CubeSats in the P-POD. Protrusions beyond the maximum dimensions are allowed by the standard specification, to a maximum of 6.5 mm beyond each side. Any protrusions may not interfere with the deployment rails and are typically occupied by antennas and solar panels. In Revision 13 of the CubeSat Design Specification an extra available volume was defined for use on 3U projects. The additional volume is made possible by space typically wasted in the P-POD Mk III's spring mechanism. 3U CubeSats which utilize the space are designated 3U+ and may place components in a cylindrical volume centered on one end of the CubeSat. The cylindrical space has a maximum diameter of 6.4 cm and a height no greater than 3.6 cm while not allowing for any increase in mass beyond the 3U's maximum of 4 kg. Propulsion systems and antennas are the most common components that might require the additional volume, though the payload sometimes extends into this volume. Deviations from the dimension and mass requirements can be waived following application and negotiation with the launch service provider. CubeSat structures do not have all the same strength concerns as larger satellites do, as they have the added benefit of the deployer supporting them structurally during launch. Still, some CubeSats will undergo vibration analysis or structural analysis to ensure that components unsupported by the P-POD remain structurally sound throughout the launch. Despite rarely undergoing the analysis that larger satellites do, CubeSats rarely fail due to mechanical issues. Like larger satellites, CubeSats often feature multiple computers handling different tasks in parallel including the attitude control (orientation), power management, payload operation, and primary control tasks. COTS attitude control systems typically include their own computer, as do the power management systems. Payloads must be able to interface with the primary computer to be useful, which sometimes requires the use of another small computer. This may be due to limitations in the primary computer's ability to control the payload with limited communication protocols, to prevent overloading the primary computer with raw data handling, or to ensure payload's operation continues uninterrupted by the spacecraft's other computing needs such as communication. Still, the primary computer may be used for payload related tasks, which might include image processing, data analysis, and data compression. Tasks which the primary computer typically handles include the delegation of tasks to the other computers, attitude control (orientation), calculations for orbital maneuvers, scheduling, and activation of active thermal control components. 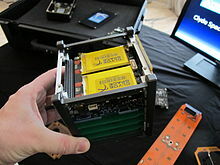 CubeSat computers are highly susceptible to radiation and builders will take special steps to ensure proper operation in the high radiation of space, such as the use of ECC RAM. Some satellites may incorporate redundancy by implementing multiple primary computers, this could be done on valuable missions to lessen the risk of mission failure. Consumer smartphones have been used for computing in some CubeSats, such as NASA's PhoneSats. Attitude control (orientation) for CubeSats relies on miniaturizing technology without significant performance degradation. Tumbling typically occurs as soon as a CubeSat is deployed, due to asymmetric deployment forces and bumping with other CubeSats. Some CubeSats operate normally while tumbling, but those that require pointing in a certain direction or cannot operate safely while spinning, must be detumbled. Systems that perform attitude determination and control include reaction wheels, magnetorquers, thrusters, star trackers, Sun sensors, Earth sensors, angular rate sensors, and GPS receivers and antennas. Combinations of these systems are typically seen in order to take each method's advantages and mitigate their shortcomings. Reaction wheels are commonly utilized for their ability to impart relatively large moments for any given energy input, but reaction wheel's utility is limited due to saturation, the point at which a wheel cannot spin faster. Examples of CubeSat reaction wheels include the Maryland Aerospace MAI-101 and the Sinclair Interplanetary RW-0.03-4. Reaction wheels can be desaturated with the use of thrusters or magnetorquers. Thrusters can provide large moments by imparting a couple on the spacecraft but inefficiencies in small propulsion systems cause thrusters to run out of fuel rapidly. Commonly found on nearly all CubeSats are magnetorquers which run electricity through a solenoid to take advantage of Earth's magnetic field to produce a turning moment. Attitude-control modules and solar panels typically feature built-in magnetorquers. For CubeSats that only need to detumble, no attitude determination method beyond an angular rate sensor or electronic gyroscope is necessary. Pointing in a specific direction is necessary for Earth observation, orbital maneuvers, maximizing solar power, and some scientific instruments. Directional pointing accuracy can be achieved by sensing Earth and its horizon, the Sun, or specific stars. Sinclair Interplanetary's SS-411 sun sensor and ST-16 star tracker both have applications for CubeSats and have flight heritage. Pumpkin's Colony I Bus uses an aerodynamic wing for passive attitude stabilization. Determination of a CubeSat's location can be done through the use of on-board GPS, which is relatively expensive for a CubeSat, or by relaying radar tracking data to the craft from Earth-based tracking systems. CubeSat propulsion has made rapid advancements in the following technologies: cold gas, chemical propulsion, electric propulsion, and solar sails. The biggest challenge with CubeSat propulsion is preventing risk to the launch vehicle and its primary payload while still providing significant capability. Components and methods that are commonly used in larger satellites are disallowed or limited, and the CubeSat Design Specification (CDS) requires a waiver for pressurization above 1.2 standard atmospheres, over 100 Wh of stored chemical energy, and hazardous materials. Those restrictions pose great challenges for CubeSat propulsion systems, as typical space propulsion systems utilize combinations of high pressures, high energy densities, and hazardous materials. Beyond the restrictions set forth by launch service providers, various technical challenges further reduce the usefulness of CubeSat propulsion. Gimbaled thrust cannot be used in small engines due to the complexity of gimbaling mechanisms, thrust vectoring must instead be achieved by thrusting asymmetrically in multiple-nozzle propulsion systems or by changing the center of mass relative to the CubeSat's geometry with actuated components. Small motors may also not have room for throttling methods that allow smaller than fully on thrust, which is important for precision maneuvers such as rendezvous. CubeSats which require longer life also benefit from propulsion systems, when used for orbit keeping a propulsion system can slow orbital decay. A cold gas thruster typically stores inert gas, such as nitrogen, in a pressurized tank and releases the gas through a nozzle to produce thrust. Operation is handled by just a single valve in most systems, which makes cold gas the simplest useful propulsion technology. Cold gas propulsion systems can be very safe since the gases used do not have to be volatile or corrosive, though some systems opt to feature dangerous gases such as sulfur dioxide. This ability to use inert gases is highly advantageous to CubeSats as they are usually restricted from hazardous materials. Unfortunately, only low performance can be achieved with them, preventing high impulse maneuvers even in low mass CubeSats. Due to this low performance, their use in CubeSats for main propulsion is limited and designers choose higher efficiency systems with only minor increases in complexity. Cold gas systems more often see use in CubeSat attitude control. Chemical propulsion systems use a chemical reaction to produce a high-pressure, high-temperature gas that accelerates out of a nozzle. Chemical propellant can be liquid, solid or a hybrid of both. Liquid propellants can be a monopropellant passed through a catalyst, or bipropellant which combusts an oxidizer and a fuel. The benefits of monopropellants are relatively low-complexity/high-thrust output, low power requirements, and high reliability. Monopropellant motors tend to have high thrust while remaining comparatively simple, which also provides high reliability. These motors are practical for CubeSats due to their low power requirements and because their simplicity allows them to be very small. Small hydrazine fueled motors have been developed, but may require a waiver to fly due to restrictions on hazardous chemicals set forth in the CubeSat Design Specification. Safer chemical propellants which would not require hazardous chemical waivers are being developed, such as AF-M315 (hydroxylammonium nitrate) for which motors are being or have been designed. A "Water Electrolysis Thruster" is technically a chemical propulsion system, as it burns hydrogen and oxygen which it generates by on-orbit electrolysis of water. CubeSat electric propulsion typically uses electric energy to accelerate propellant to high speed, which results in high specific impulse. Many of these technologies can be made small enough for use in nanosatellites, and several methods are in development. Types of electric propulsion currently being designed for use in CubeSats include Hall-effect thrusters, ion thrusters, pulsed plasma thrusters, electrospray thrusters, and resistojets. Several notable CubeSat missions plan to use electric propulsion, such as NASA's Lunar IceCube. The high efficiency associated with electric propulsion could allow CubeSats to propel themselves to Mars. Electric propulsion systems are disadvantaged in their use of power, which requires the CubeSat to have larger solar cells, more complicated power distribution, and often larger batteries. Furthermore, many electric propulsion methods may still require pressurized tanks to store propellant, which is restricted by the CubeSat Design Specification. The ESTCube-1 used an electric solar-wind sail, which is nothing like a solar sail, despite its name. This technology used an electric field to deflect protons from solar wind to produce thrust. It is similar to an electrodynamic tether in that the craft only needs to supply electricity to operate. Solar sails (also called light sails or photon sails) are a form of spacecraft propulsion using the radiation pressure (also called solar pressure) from stars to push large ultra-thin mirrors to high speeds, requiring no propellant. Force from a solar sail scales with the sail's area, this makes sails well suited for use in CubeSats as their small mass results in the greater acceleration for a given solar sail's area. However, solar sails still need to be quite large compared to the satellite, which means useful solar sails must be deployed, adding mechanical complexity and a potential source of failure. This propulsion method is the only one not plagued with restrictions set by the CubeSat Design Specification, as it does not require high pressures, hazardous materials, or significant chemical energy. Few CubeSats have employed a solar sail as its main propulsion and stability in deep space, including the 3U NanoSail-D2 launched in 2010, and the LightSail-1 in May 2015. CubeSail is currently testing in orbit a 260 m-long, 20 m2 solar sail ribbon extended between two CubeSats, that will inform the design for a much larger concept called UltraSail heliogyro. LightSail-2 is scheduled for launch on a Falcon Heavy rocket in 2019, while at least two CubeSats that plan to launch on the Space Launch System's first flight (Exploration Mission-1) in June 2020 are set to use solar sails: the Near-Earth Asteroid Scout (NEA Scout) and the Lunar Flashlight. CubeSats use solar cells to convert solar light to electricity that is then stored in rechargeable lithium-ion batteries that provide power during eclipse as well as during peak load times. These satellites have a limited surface area on their external walls for solar cells assembly, and has to be effectively shared with other parts, such as antennas, optical sensors, camera lens, propulsion systems, and access port. Lithium-ion batteries feature high energy-to-mass ratios, making them well suited to use on mass-restricted spacecraft. Battery charging and discharging is typically handled by a dedicated electrical power system (EPS). Batteries sometimes feature heaters to prevent the battery from reaching dangerously low temperatures which might cause battery and mission failure. Missions with higher power requirements can make use of attitude control to ensure the solar panels remain in their most effective orientation toward the Sun, and further power needs can be met through the addition and orientation of deployed solar arrays. Recent innovations include additional spring-loaded solar arrays that deploy as soon as the satellite is released, as well as arrays that feature thermal knife mechanisms that would deploy the panels when commanded. CubeSats may not be powered between launch and deployment, and must feature a remove-before-flight pin which cuts all power to prevent operation during loading into the P-POD. Additionally, a deployment switch is actuated while the craft is loaded into a P-POD, cutting power to the spacecraft and is deactivated after exiting the P-POD. Deployable high-gain mesh reflector antenna operating at Ka-band for the Radar in a Cubesat (Raincube). The low cost of CubeSats has enabled unprecedented access to space for smaller institutions and organizations but, for most CubeSat forms, the range and available power is limited to about 2W for its communications antennae. They can use radio-communication systems in the VHF, UHF, L-, S-, C- and X-band. For UHF/VHF transmissions, a single helical antenna or four monopole antennae are deployed by a spring-loaded mechanism. Because of tumbling and low power range, radio-communications are a challenge. Many CubeSats use an omnidirectional monopole or dipole antenna built with commercial measuring tape. For more demanding needs, some companies offer high-gain antennae for CubeSats, but their deployment and pointing systems are significantly more complex. For example, MIT and JPL are developing an inflatable dish antenna with a useful range to the Moon but appears to be poorly efficient. JPL has successfully developed X-band and Ka-band high-gain antennas for MarCO and Radar in a CubeSat (RainCube) missions. Traditionally, Low Earth Orbit Cubesats use antennas for communication purpose at UHF and S-band. To venture farther in the solar system, larger antennas compatible with the Deep Space Network (X-band and Ka-band) are required. JPL's engineers developed several deployable high-gain antennas compatible with 6U-class CubeSats for MarCO and Near-Earth Asteroid Scout. JPL's engineers have also developed a 0.5m mesh reflector antenna operating at Ka-band and compatible with the DSN that folds in a 1.5U stowage volume. For MarCO, JPL's antenna engineers designed a Folded Panel Reflectarray (FPR) to fit on a 6U Cubesat bus and supports X-band Mars-to-Earth telecommunications at 8kbit/s at 1AU. Different CubeSat components possess different acceptable temperature ranges, beyond which they may become temporarily or permanently inoperable. Satellites in orbit are heated by radiative heat emitted from the Sun directly and reflected off Earth, as well as heat generated by the craft's components. CubeSats must also cool by radiating heat either into space or into the cooler Earth's surface, if it is cooler than the spacecraft. All of these radiative heat sources and sinks are rather constant and very predictable, so long as the CubeSat's orbit and eclipse time are known. Components used to ensure the temperature requirements are met in CubeSats include multi-layer insulation and heaters for the battery. Other spacecraft thermal control techniques in small satellites include specific component placement based on expected thermal output of those components and, rarely, deployed thermal devices such as louvers. Analysis and simulation of the spacecraft's thermal model is an important determining factor in applying thermal management components and techniques. CubeSats with special thermal concerns, often associated with certain deployment mechanisms and payloads, may be tested in a thermal vacuum chamber before launch. Such testing provides a larger degree of assurance than full-sized satellites can receive, since CubeSats are small enough to fit inside of a thermal vacuum chamber in their entirety. Temperature sensors are typically placed on different CubeSat components so that action may be taken to avoid dangerous temperature ranges, such as reorienting the craft in order to avoid or introduce direct thermal radiation to a specific part, thereby allowing it to cool or heat. CubeSat forms a cost-effective independent means of getting a payload into orbit. After delays from low-cost launchers such as Interorbital Systems, launch prices have been about $100,000 per unit, but newer operators are offering lower pricing. Some CubeSats have complicated components or instruments, such as LightSail-1, that pushes their construction cost into the millions, but a basic 1U CubeSat can cost about $50,000 to construct so CubeSats are a viable option for some schools and universities; as well as small businesses to develop CubeSats for commercial purposes. NanoRacks CubeSats being launched from the NanoRacks CubeSat Deployer on the ISS on February 25, 2014. The searchable Nanosatellite database lists almost 2,000 CubeSats that have been launched since 1998. 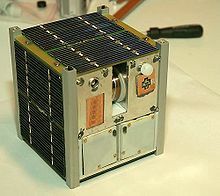 One of the earliest CubeSat launches was on 30 June 2003 from Plesetsk, Russia, with Eurockot Launch Services's Multiple Orbit Mission. CubeSats were put into a Sun-synchronous orbit and included the Danish AAU CubeSat and DTUSat, the Japanese XI-IV and CUTE-1, the Canadian Can X-1, and the US Quakesat. On February 13, 2012, three PPODs deployers containing seven CubeSats were placed into orbit along with the Lares satellite aboard a Vega rocket launched from French Guiana. The CubeSats launched were e-st@r Space (Politecnico di Torino, Italy), Goliat (University of Bucarest, Romania), MaSat-1 (Budapest University of Technology and Economics, Hungary), PW-Sat (Warsaw University of Technology, Poland), Robusta (University of Montpellier 2, France), UniCubeSat-GG (University of Rome La Sapienza, Italy), and XaTcobeo (University of Vigo and INTA, Spain). The CubeSats were launched in the framework of the "Vega Maiden Flight" opportunity of the European Space Agency. On September 13, 2012, eleven CubeSats were launched from eight P-PODs, as part of the "OutSat" secondary payload aboard a United Launch Alliance Atlas V rocket. This was the largest number of CubeSats (and largest volume of 24U) successfully placed to orbit on a single launch, this was made possible by use of the new NPS CubeSat Launcher system (NPSCuL) developed at the Naval Postgraduate School (NPS). The following CubeSats were placed in orbit: SMDC-ONE 2.2 (Baker), SMDC-ONE 2.1 (Able), AeroCube 4.0(x3), Aeneas, CSSWE, CP5, CXBN, CINEMA, and Re (STARE). Five CubeSats (Raiko, Niwaka, We-Wish, TechEdSat, F-1) were placed into orbit from the International Space Station on October 4, 2012, as a technology demonstration of small satellite deployment from the ISS. They were launched and delivered to ISS as a cargo of Kounotori 3, and an ISS astronaut prepared the deployment mechanism attached to Japanese Experiment Module's robotic arm. Four CubeSats were deployed from the Cygnus Mass Simulator, which was launched April 21, 2013 on the maiden flight of Orbital Sciences' Antares rocket. Three of them are 1U PhoneSats built by NASA's Ames Research Center to demonstrate the use of smart phones as avionics in CubeSats. The fourth was a 3U satellite, called Dove-1, built by Planet Labs. A total of thirty-three CubeSats were deployed from the ISS on February 11, 2014. Of those thirty-three, twenty-eight were part of the Flock-1 constellation of Earth-imaging CubeSats. Of the other five, two are from other US-based companies, two from Lithuania, and one from Peru. The LightSail-1 is a 3U CubeSat prototype propelled by a solar sail. It was launched on 20 May 2015 from Florida. Its four sails are made of very thin Mylar and have a total area of 32 m2. This test will allow a full checkout of the satellite's systems in advance of the main 2016 mission. On October 5, 2015, AAUSAT5 (Aalborg University, Denmark), was deployed from the ISS. launched in the framework of the "Fly Your Satellite!" programme of the European Space Agency. The Miniature X-ray Solar Spectrometer CubeSat is a 3U launched to the International Space Station on 6 December 2015 from where it was deployed on 16 May 2016. It is the first mission launched in the NASA Science Mission Directorate CubeSat Integration Panel, which is focused on doing science with CubeSats. As of 12 July 2016, the minimum mission success criteria (one month of science observations) has been met, but the spacecraft continues to perform nominally and observations continue. Three CubeSats were launched on April 25, 2016 together with Sentinel-1B on a Soyuz rocket VS14 launched from Kourou, French Guiana. The satellites were: AAUSAT4 (Aalborg University, Denmark), e-st@r-II (Politecnico di Torino, Italy) and OUFTI-1 (Université de Liège, Belgium). The CubeSats were launched in the framework of the "Fly Your Satellite!" programme of the European Space Agency. The May 2018 launch of the InSight stationary Mars lander included two CubeSats to flyby Mars to provide additional relay communications from InSight to Earth during entry and landing. This is the first flight of CubeSats in deep space. The mission CubeSat technology is called Mars Cube One (MarCO), each one is a six-unit CubeSat, 14.4 inches (36.6 centimeters) by 9.5 inches (24.3 centimeters) by 4.6 inches (11.8 centimeters). 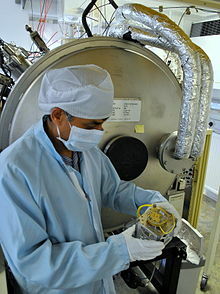 MarCo is an experiment, but not necessary for the InSight mission, to add relay communications to space missions in important time durations, in this case from the time of InSight atmospheric entry to its landing. MarCO launched in May 2018 with the InSight lander, separated after launch and then traveled in their own trajectories to Mars. After separation, both MarCO spacecraft deployed two radio antennas and two solar panels. The high-gain, X-band antenna is a flat panel to direct radio waves. MarCO navigated to Mars independently from the InSight lander, making their own course adjustments on the flight. During InSight's entry, descent and landing (EDL) in November 2018, the lander transmitted telemetry in the UHF radio band to NASA's Mars Reconnaissance Orbiter (MRO) flying overhead. MRO forwarded EDL information to Earth using a radio frequency in the X band, but cannot simultaneously receive information in one band if transmitting on another. Confirmation of a successful landing could be received on Earth several hours after, so MarCO was a technology demonstration of real-time telemetry during the landing. NASA's CubeSat Launch Initiative, created in 2010, provides CubeSat launch opportunities to educational institutions, non-profit organizations and NASA Centers. Since its inception the CubeSat Launch Initiative has launched 46 CubeSats flown on 12 ELaNa Missions from 28 unique organizations and has selected 119 CubeSat missions from 66 unique organizations. Educational Launch of Nanosatellites (ELaNa) missions have included: BisonSat the first CubeSat built by a tribal college, TJ3Sat the first CubeSat built by a high school and STMSat-1 the first CubeSat built by an elementary school. NASA releases an Announcement of Opportunity in August of each year with selections made the following February. NASA initiated the Cube Quest Challenge in 2015, a competition to foster innovation in the use of CubeSats beyond low Earth orbit. The Cube Quest Challenge offers a total of $5 million to teams that meet the challenge objectives of designing, building and delivering flight-qualified, small satellites capable of advanced operations near and beyond the Moon. Teams compete for a variety of prizes in lunar orbit or deep space. Thirteen CubeSats from different teams will be launched to cislunar space in June 2020 as secondary payloads on board the SLS Exploration Mission 1. "Fly Your Satellite!" is the recurring CubeSats programme of the Education Office of the European Space Agency. University students have the opportunity to develop and implement their CubeSat mission with support of ESA specialists. Participating student teams can experience the full cycle from designing, building, and testing to eventually, the possibility of launching and operating their CubeSat. QB50 is a proposed international network of 50 CubeSats for multi-point, in-situ measurements in the lower thermosphere (90–350 km) and re-entry research. QB50 is an initiative of the Von Karman Institute and is funded by the European Commission as part of the 7th Framework Programme (FP7). Double-unit (2U) CubeSats (10×10×20 cm) are developed, with one unit (the 'functional' unit) providing the usual satellite functions and the other unit (the 'science' unit) accommodating a set of standardised sensors for lower thermosphere and re-entry research. 35 CubeSats are envisaged to be provided by universities from 22 countries around the world, among them 4 are from the US, 4 from China, 4 from France, 3 from Australia and 3 South Korea. Ten 2U or 3U CubeSats are foreseen to serve for in-orbit technology demonstration of new space technologies. Unlike full-sized spacecraft, CubeSats have the ability to be delivered into space as cargo and then deployed by the International Space Station. This presents an alternative method of achieving orbit apart from launch and deployment by a launch vehicle. NanoRacks and Made in Space are developing means of constructing CubeSats on the International Space Station. NASA's CubeSat Launch Initiative has launched more than 46 CubeSats on its ELaNa missions over the last several years, and as of 2016, 57 are manifested for flight over the next few years. No matter how inexpensive or versatile CubeSats may be, they must hitch rides as secondary payload on large rockets launching much larger spacecraft, at prices starting around $100,000. Since CubeSats are deployed by P-PODs and similar deployment systems, they can be integrated and launched into virtually any launch vehicle. However, some launch service providers refuse to launch CubeSats, whether on all launches or only on specific launches, two examples are ILS and Sea Launch. SpaceX and Japan Manned Space Systems Corporation (JAMSS) are two recent companies that offer commercial launch services for CubeSats as secondary payload, but a launch backlog still exists. Additionally, India's ISRO has been commercially launching foreign CubeSats since 2009 as secondary payloads. On 15 Feb 2017, ISRO set the world record by launching 103 CubeSats on board its Polar Satellite Launch Vehicle for various foreign companies  ISC Kosmotras and Eurockot also offer launch services for CubeSats. On 5 May 2015, NASA announced a program based at the Kennedy Space Center dedicated to develop a new class of rockets designed specifically to launch very small satellites: the NASA Venture Class Launch Services (VCLS), which will offer a payload mass of 30 kg to 60 kg for each launcher. Five months later, in October 2015, NASA awarded a total of $17.1 million to three separate startup launch companies for one flight each: $6.9 million to Rocket Lab (Electron rocket); $5.5 million to Firefly Space Systems (Alpha rocket); and $4.7 million to Virgin Galactic (LauncherOne rocket). The payloads for the three flights under the VCLS contract have not yet been assigned. Other small satellite launch systems are under development that would carry CubeSats alongside a small payload, including the Neptune series of rockets by Interorbital Systems, Garvey Spacecraft's Nanosat Launch Vehicle, and the SPARK rocket. In addition to conventional launch vehicles and launch facilitators like KSF Space, several air launch to orbit vehicles are in the works by Swiss Space Systems, Generation Orbit Launch Services, and Boeing (in the form of their Small Launch Vehicle). As of December 2015, only one launch vehicle that emphasizes small CubeSat payloads has made a launch attempt, the SPARK, broke up shortly after launch on 4 November 2015. The rocket was carrying 12 CubeSats of various sizes along with its 55 kilogram primary payload. Rocket Lab's CubeSats are planned to be launched from New Zealand. Many of the aforementioned characteristics or properties of CubeSats such as structure, propulsion, material, computing and telecommunications, power, and any additional specific instruments or measurement devices pose challenges to the expansion of use of CubeSat technology beyond Earth’s orbit. 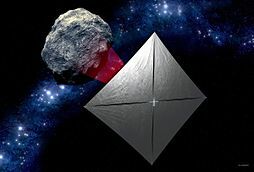 These challenges have been increasingly under consideration of international organizations over the past decade, for example, proposed in 2012 by NASA and the Jet Propulsion Lab, the INSPIRE spacecraft is an initial attempt at a spacecraft designed to prove the operational abilities of deep space CubeSats. The launch date was expected to be 2014, but has yet to do so and the date is currently listed by NASA as TBD. P-PODs were designed with CubeSats to provide a common platform for secondary payloads. P-PODs are mounted to a launch vehicle and carry CubeSats into orbit and deploy them once the proper signal is received from the launch vehicle. The P-POD Mk III has capacity for three 1U CubeSats, or other 0.5U, 1U, 1.5U, 2U, or 3U CubeSats combination up to a maximum volume of 3U. Other CubeSat deployers exist, with the NanoRacks CubeSat Deployer (NRCSD) on the International Space Station being the most popular method of CubeSat deployment as of 2014. Some CubeSat deployers are created by companies, such as the ISIPOD (Innovative Solutions In Space BV) or SPL (Astro und Feinwerktechnik Adlershof GmbH), while some have been created by governments or other non-profit institutions such as the X-POD (University of Toronto), T-POD (University of Tokyo), or the J-SSOD (JAXA) on the International Space Station. 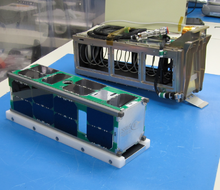 While the P-POD is limited to launching a 3U CubeSat at most, the NRCSD can launch a 6U (10×10×68.1 cm) CubeSat and the ISIPOD can launch a different form of 6U CubeSat (10×22.63×34.05 cm). While nearly all CubeSats are deployed from a launch vehicle or the International Space Station, some are deployed by the primary payloads themselves. For example, FASTSAT deployed the NanoSail-D2, a 3U CubeSat. This was done again with the Cygnus Mass Simulator as the primary payload launched on the maiden flight of the Antares rocket, carrying and later deploying four CubeSats. For CubeSat applications beyond Earth's orbit, the method of deploying the satellites from the primary payload will also be adopted. Eleven CubeSats are planned to be launched on the Space Launch System's Exploration Mission 1, which would place them in the vicinity of the Moon. InSight, a Mars lander, also brought CubeSats beyond Earth orbit to use them as relay communications satellites. Known as MarCO A and B, they are the first CubeSats sent beyond the Earth–Moon system. Chasqui I saw a unique deployment process, when it was deployed by hand during a spacewalk on the International Space Station in 2014. ^ "NASA Venture Class procurement could nurture, ride small sat trend". Space News. 8 June 2015. ^ a b c d e f g Mehrparvar, Arash (February 20, 2014). "CubeSat Design Specification" (PDF). The CubeSat Program, CalPoly SLO. The CubeSat Program, CalPoly SLO. Retrieved March 25, 2017. ^ a b c "CubeSat Database – swartwout". sites.google.com. Retrieved 2015-10-19. ^ a b c d Kulu, Erik. "Nanosatellite & CubeSat Database". Nanosatellite & CubeSat Database. Retrieved 19 January 2019. ^ "Nanosatellites by launch years". nanosats.eu. Retrieved 2019-01-19. ^ "Total CubeSats Launched". nanosats.eu. Retrieved 2019-01-19. ^ a b "Tiny Satellites for Big Science – Astrobiology Magazine". Astrobiology Magazine. Retrieved 2015-10-20. ^ "Tiny Cubesats Set to Explore Deep Space". Space.com. Retrieved 2015-10-20. ^ Stirone, Shannon (18 March 2019). "Space Is Very Big. Some of Its New Explorers Will Be Tiny. - The success of NASA's MarCO mission means that so-called cubesats likely will travel to distant reaches of our solar system". The New York Times. Retrieved 18 March 2019. ^ Messier, Douglas (22 May 2015). "Tiny 'Cubesats' Gaining Bigger Role in Space". Space.com. Retrieved 2015-05-23. ^ a b c Helvajian, Henry; Janson, Siegfried W., eds. (2008). Small Satellites: Past, Present, and Future. El Segundo, Calif.: Aerospace Press. ISBN 978-1-884989-22-3. ^ "Cubist Movement". Space News. 2012-08-13. p. 30. When professors Jordi Puig-Suari of California Polytechnic State University and Bob Twiggs of Stanford University invented the CubeSat, they never imagined that the tiny satellites would be adopted by universities, companies and government agencies around the world. They simply wanted to design a spacecraft with capabilities similar to Sputnik that graduate student could design, build, test and operate. For size, the professors settled on a 10-centimeter cube because it was large enough to accommodate a basic communications payload, solar panels and a battery. ^ a b Leonard David (2004). "CubeSats: Tiny Spacecraft, Huge Payoffs". Space.com. Retrieved 2008-12-07. ^ Rob Goldsmith (October 6, 2009). "Satellite pioneer joins Morehead State's space science faculty". Space Fellowship. Retrieved 2010-09-20. ^ Leonard David (2006). "CubeSat losses spur new development". Space.com. Retrieved 2008-12-11. ^ "AeroCube 6A, 6B (CubeRad A, B)". space.skyrocket.de. Retrieved 2015-10-18. ^ "Educational Payload on the Vega Maiden Flight – Call For CubeSat Proposals" (PDF). European Space Agency. 2008. Retrieved 2008-12-07. ^ "PCI/104-Express – PC/104 Consortium". PC/104 Consortium. Retrieved 2015-10-22. ^ "FAQ". www.cubesatshop.com. Retrieved 2015-10-22. ^ "Space Radiation Effects on Electronic Components in Low Earth Orbit". DIY Space Exploration. Archived from the original on 2015-10-27. Retrieved 2015-11-05. ^ "Whisker Failures". NASA. 2009-08-09. Retrieved 2015-11-05. ^ a b c d e Kakoyiannis, Constantine; Constantinou, Philip. Electrically Small Microstrip Antennas Targeting (PDF). Microstrip Antennas. Greece: National Technical University of Athens. ^ a b The official standard only defines up to 3U and 3U+ (a slightly larger but same-mass 3U). Larger sizes use have varying definitions depending on source. There is some confusion about 3U and 1U: the official standard claims a 3U masses at most 4 kg, while Spaceflight Services claims (see "Archived copy". Archived from the original on 2014-07-03. Retrieved 2014-07-07. CS1 maint: Archived copy as title (link) ) that 3U extends to 5 kg. 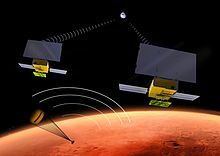 ^ "MarCO: Planetary CubeSats Become Real". www.planetary.org. Retrieved 2016-02-23. ^ Clark, Stephen. "Launch of NASA's next Mars mission delayed until at least 2018 | Spaceflight Now". Retrieved 2016-02-23. ^ "CubeSat". space.skyrocket.de. Retrieved 2015-10-18. ^ Athirah, Nur; Afendi, Mohd; Hafizan, Ku; Amin, N.A.M. ; Majid, M.S. Abdul. "Stress and Thermal Analysis of CubeSat Structure". Applied Mechanics and Materials. 554: 426–430. doi:10.4028/www.scientific.net/amm.554.426. ^ Swartwout, Michael (December 2013). "The First One Hundred CubeSats: A Statistical Look" (PDF). Journal of Small Satellites. Retrieved 28 November 2015. ^ "Maryland Aerospace Reaction Wheels". Archived from the original on July 16, 2015. Retrieved September 4, 2015. ^ "Sinclair Interplanetary Reaction Wheels". Retrieved September 4, 2015. ^ "Sinclair Interplanetary Sun Sensors". Retrieved September 4, 2015. ^ "Sinclair Interplanetary Star Trackers". Retrieved September 4, 2015. ^ Kalman, Andrew (4 Nov 2009). "Pumkin's Colony I CubeSat Bus" (PDF). Retrieved September 4, 2015. ^ Frost, Chad (February 2014). "Small Spacecraft Technology State of the Art" (PDF). NASA. NASA Ames. Archived from the original (PDF) on February 26, 2015. Retrieved September 4, 2015. ^ "PowerCube". www.tethers.com. Retrieved 2015-11-26. ^ Casiano, Matthew; Hulka, James; Yang, Vigor. Liquid-Propellant Rocket Engine Throttling: A Comprehensive Review. American Institute of Aeronautics and Astronautics. doi:10.2514/6.2009-5135. ^ a b "Spacecraft Propulsion – Chemical". www.sv.vt.edu. Archived from the original on 2015-10-04. Retrieved 2015-11-26. ^ CU Aerospace, LLC. "Propulsion Unit for Cubesats (PUC)". CU Aerospace, LLC. Retrieved 26 Nov 2015. ^ a b "Aerojet CubeSat Thrusters". Aerojet Rocketdyne. Retrieved September 4, 2015. ^ "Busek Green monopropellant thruster". Busek Space Propulsion. Busek. Retrieved September 4, 2015. ^ "HYDROS – Water Electrolysis Thruster". Tethers Unlimited, Inc. 2015. Retrieved 2015-06-10. ^ "Busek Hall Effect Thrusters". www.busek.com. Retrieved 2015-11-27. ^ "Busek Ion Thrusters". www.busek.com. Retrieved 2015-11-27. ^ "PPTCUP". www.mars-space.co.uk. Retrieved 2015-11-27. ^ "Busek Electrospray Thrusters". www.busek.com. Retrieved 2015-11-27. ^ "Busek Electrothermal Thrusters". www.busek.com. Retrieved 2015-11-27. ^ "Lunar IceCube to Take on Big Mission from Small Package". NASA. 2015. Retrieved 2015-09-01. ^ "Mars missions on the cheap". The Space Review. USA. 5 May 2014. Retrieved 2015-05-21. ^ Davis, Jason (1 March 2016). "Meet LightSail 2, The Planetary Society's new solar sailing CubeSat". The Planetary Society. Retrieved 2016-03-01. ^ McNutt, Leslie; Castillo-Rogez, Julie (2014). "Near-Earth Asteroid Scout" (PDF). NASA. American Institute of Aeronautics and Astronautics. Retrieved 2015-05-13. ^ "CubeSats: Power System and Budget Analysis". DIY Space Exploration. 2015. Archived from the original on 2015-05-22. Retrieved 2015-05-22. ^ "Batteries". The CubeSat Cookbook. Retrieved 2015-10-20. ^ "Lithium Battery Failures". www.mpoweruk.com. Retrieved 2015-10-20. ^ a b c Ochoa, Daniel (2014). "Deployable Helical Antenna for Nano-Satellite" (PDF). Northrop Grumman Aerospace Systems. Retrieved 2015-05-21. ^ Chu, Jennifer (6 September 2015). "Inflatable antennae could give CubeSats greater reach". MIT News. USA. Retrieved 2015-05-21. ^ a b c Hodges, R. E.; Chahat, N. E.; Hoppe, D. J.; Vacchione, J. D. (2016-06-01). "The Mars Cube One deployable high gain antenna". 2016 IEEE International Symposium on Antennas and Propagation (APSURSI): 1533–1534. doi:10.1109/APS.2016.7696473. ^ a b Chahat, Nacer. "Dr. Nacer Chahat Interview on High-gain deployable antennas for CubeSats". Hackaday. ^ Chahat, N.; Hodges, R. E.; Sauder, J.; Thomson, M.; Peral, E.; Rahmat-Samii, Y. (2016-06-01). "CubeSat Deployable Ka-Band Mesh Reflector Antenna Development for Earth Science Missions". IEEE Transactions on Antennas and Propagation. 64 (6): 2083–2093. Bibcode:2016ITAP...64.2083C. doi:10.1109/TAP.2016.2546306. ISSN 0018-926X. ^ "A Box of 'Black Magic' to Study Earth from Space". NASA/JPL. Retrieved 2017-01-22. ^ a b By. "Interview: Nacer Chahat Designs Antennas for Mars CubeSats". Hackaday. Retrieved 2017-02-25. ^ "NEA Scout mission". NASA.gov. ^ Chahat, N.; Hodges, R. E.; Sauder, J.; Thomson, M.; Rahmat-Samii, Y. (2017-01-01). "Deep Space Network Telecommunication CubeSat Antenna: Using the deployable Ka-band mesh reflector antenna". IEEE Antennas and Propagation Magazine. PP (99): 1–1. Bibcode:2017IAPM...59...31C. doi:10.1109/MAP.2017.2655576. ISSN 1045-9243. ^ Hodges, R. E.; Chahat, N.; Hoppe, D. J.; Vacchione, J. D. (2017-01-01). "A Deployable High-Gain Antenna Bound for Mars: Developing a new folded-panel reflectarray for the first CubeSat mission to Mars". IEEE Antennas and Propagation Magazine. PP (99): 1–1. Bibcode:2017IAPM...59...39H. doi:10.1109/MAP.2017.2655561. ISSN 1045-9243. ^ As noted in the linked article, Interorbital promised its Neptune 45 – intended to carry 10 CubeSats, among other cargo – would launch in 2011, but as of 2014 it had yet to do so. ^ "OSSI-1 Amateur Radio CubeSat launched". Southgate Amateur Radio News. 2013. Retrieved 2014-07-07. ^ "Commercial Space Launch Schedule and Pricing". Spaceflight. Archived from the original on 2015-10-16. Retrieved 2015-10-18. ^ "After letdown, solar-sail project rises again". msnbc.com. Retrieved 2015-10-18. ^ "Cubesats explained and why you should build one". DIY Space Exploration. Archived from the original on 2015-10-13. Retrieved 2015-10-18. ^ "EUROCKOT Successfully Launches MOM – Rockot hits different Orbits". 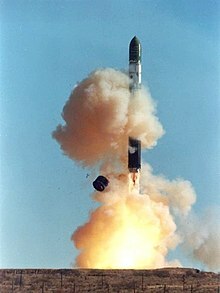 Eurockot Launch Services. Archived from the original on 2010-03-03. Retrieved 2010-07-26. ^ ESA (13 February 2012). "Seven Cubesats launched on Vega's maiden flight". European Space Agency. Retrieved February 3, 2014. ^ Space.com (Sep 2012). "Air Force Launches Secret Spy Satellite NROL-36". Space.com. Retrieved March 21, 2013. ^ NRO (June 2012). "NROL-36 Features Auxiliary Payloads" (PDF). National Reconnaissance Office. Retrieved March 21, 2013. ^ Kuniaki Shiraki (March 2, 2011). "「きぼう」からの小型衛星放出に係る技術検証について" [On Technical Verification of Releasing Small Satellites from "Kibo"] (PDF) (in Japanese). JAXA. Retrieved March 4, 2011. ^ Mitsumasa Takahashi (June 15, 2011). "「きぼう」からの小型衛星放出実証ミッションに係る搭載小型衛星の選定結果について" (PDF). JAXA. Retrieved June 18, 2011. ^ "「きぼう」日本実験棟からの小型衛星放出ミッション" (in Japanese). JAXA. October 5, 2012. Archived from the original on November 13, 2012. Retrieved December 1, 2012. ^ "Antares Test Launch "A-ONE Mission" Overview Briefing" (PDF). Orbital Sciences. 17 April 2013. Retrieved 18 April 2013. ^ Debra Werner (February 11, 2014). "Planet Labs CubeSats Deployed from ISS with Many More To Follow". SpaceNews, Inc. Retrieved March 8, 2014. ^ Davis, Jason (January 26, 2015). "It's Official: LightSail Test Flight Scheduled for May 2015". The Planetary Society. ^ ESA (9 October 2015). "AAUSAT5 CubeSat starts its space mission". European Space Agency. Retrieved September 28, 2016. ^ "The Miniature X-ray Solar Spectrometer (MinXSS) » Minimum mission success criteria met". ^ ESA (26 April 2016). "Student satellites fly freely on their orbit in_space". European Space Agency. Retrieved April 26, 2016. ^ "India launches record 104 satellites at one go". Rueters. 15 February 2017. Retrieved February 15, 2017. ^ "India sets record with launch of 104 satellites on a single rocket". 15 February 2017. Retrieved February 15, 2017. ^ a b Chang, Kenneth (2016-03-09). "NASA Reschedules Mars InSight Mission for May 2018". The New York Times. ISSN 0362-4331. Retrieved 2016-04-28. ^ "NASA Prepares for First Interplanetary CubeSat Mission". Retrieved 2015-06-12. ^ "JPL | CubeSat". www.jpl.nasa.gov. Retrieved 2015-06-12. ^ Galica, Carol. "NASA CubeSat Launch Initiative". NASA. Retrieved 18 October 2016. ^ "Cube Quest Challenge". NASA.gov. Retrieved 2016-08-01. ^ Fly Your Satellite! ESA. ^ "Call for Proposals Fly Your Satellite". esa.int. Retrieved 2016-09-28. ^ "QB50 CubeSat List". Retrieved 20 April 2017. ^ "Two QB50 satellites with ham radio payloads delivered". AMSAT-UK. 4 May 2014. ^ "QB50 launch campaigns". Retrieved 7 December 2016. ^ Krebs, Gunter. "PSLV-XL". Gunter's Space Page. Retrieved March 9, 2017. ^ "In-Space Satellite Construction May Be Coming Soon". Space.com. Retrieved 2015-10-21. ^ Galica, Carol. "NASA CubeSat Launch Initiative Selections". NASA. Retrieved 18 October 2016. ^ a b Dean, James (16 May 2015). "NASA seeks launchers for smallest satellites". Florida Today. Retrieved 2015-05-16. ^ "The Space Review: Reusability and other issues facing the launch industry". www.thespacereview.com. Retrieved 2015-12-21. ^ Stephen Clark (2009). "Commercial launch of SpaceX Falcon 1 rocket a success". Spaceflight Now. Retrieved 2010-07-13. ^ "CubeSATs launched with SpaceX". Citizen Inventor. 18 April 2014. Retrieved 2015-05-22. ^ "Spaceflight Partners with Japan Manned Space Systems Corporation (JAMSS) to Launch Eight CubeSats on the JAXA Astro-H Mission". Spaceflight. 5 November 2014. Archived from the original on 9 March 2015. Retrieved 2015-05-22. ^ "Brazilian AESP-14 CubeSat was deployed from Kibo". JAXA. 5 February 2015. Retrieved 2015-05-22. AESP-14 takes an opportunity of Kibo's paid utilization and is deployed by Japan Manned Space Systems Corporation (JAMSS) at the request of Brazilian Space Agency. ^ "ISRO launches CubeSats". Indian Space Research Organisation. 2009. Retrieved 2015-05-22. ^ Jos Heyman (2009). "FOCUS: CubeSats — A Costing + Pricing Challenge". SatMagazine. Retrieved 2009-12-30. ^ a b Wolfinger, Rob (5 May 2015). "NASA Solicitations: VENTURE CLASS LAUNCH SERVICE – VCLS, SOL NNK15542801R". NASA. Archived from the original on 18 May 2015. Retrieved 2015-05-16. ^ Diller, George H. (7 May 2015). "NASA Hosts Media Call on Draft Solicitation for New Class of Launch Services". NASA. Retrieved 2015-05-16. ^ "NASA Issues Request for Proposals for Cubesat Launches". NASA. SpaceRef. 12 June 2015. Retrieved 2015-06-15. ^ a b Wall, Mike (14 October 2015). "NASA Picks New Rocket Rides to Launch Small Satellites". Space.com. Retrieved 2015-10-15. ^ "Garvey Spacecraft Corporation – NLV". www.garvspace.com. Retrieved 2015-12-13. ^ Clark, Stephen. "Air Force declares failure on Super Strypi test launch | Spaceflight Now". Retrieved 2015-12-13. ^ "Sky Skimmer: Rocket Lab Sets Date for Lightweight Spacecraft Test Launch". Space Daily. May 17, 2017. Retrieved 22 May 2017. ^ "The Potential of CubeSats". www.planetary.org. Retrieved 2019-03-12. ^ "JPL | CubeSat | INSPIRE". www.jpl.nasa.gov. Retrieved 2019-03-12. ^ Matthew Richard Crook (2009). "NPS CubeSat Launcher Design, Process And Requirements" (PDF). Naval Postgraduate School. Retrieved 2009-12-30. ^ "CubeSat concept – eoPortal Directory – Satellite Missions". directory.eoportal.org. Retrieved 2015-10-19. Wikimedia Commons has media related to CubeSat satellites. Murphey, 1 Stephen (2012). "what are cubesats".